The Canadian oil sands, a huge area of tar and sand being mined for crude oil, yielded fortune of other type this week when an oil company worker unearthed a 110-million-year-old dinosaur fossil that was not believed to be there. 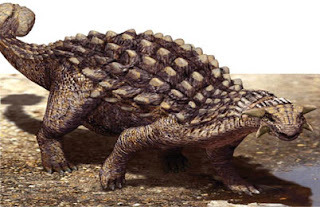 The fossil is an ankylosaur, a plant-eating dinosaur with great limbs, shield plating and a club-like tail. Finding it in this region of northern Alberta was a revelation because millions of years ago the region was enclosed by water. "We've never found a dinosaur in this location," Donald Henderson, a curator at Alberta's Royal Tyrrell Museum, which is devoted to dinosaurs, said on Friday. "Because the area was once a sea, most finds are invertebrates such as clams and ammonites." The ankylosaur that was found by the oil worker is expected to be about 5 meters (16-1/2 feet) long and 2 meters (6-1/2 feet) wide. 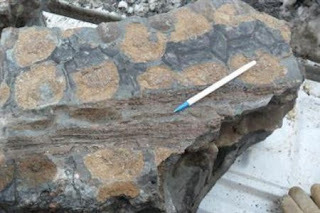 "It is pretty amazing that it survived in such good condition," said Henderson, noting the fossil was three dimensional, not flattened by the heavy rock sediment. "It is also the earliest complete dinosaur that we have from this province." The fossil was found last week by a Suncor Energy shovel operator who was clearing ground ahead of development. By a quirk of fate, the worker had visited the Royal Tyrrell dinosaur museum in southern Alberta just the week before.